veteran Noel Polanco. Officer Hassan Hamdy pulled Noel over at a traffic stop. Noel never expected what would happen next. He was shot in the chest and killed by officer Hamdy, who claims that Noel was “reaching” under the seat. Officer Hamdy pointed his gun through the open passenger window of Noel’s vehicle and opened fire, executing Noel in his car. The NYPD detective who shot and killed an unarmed National Guardsman during a traffic stop on the Grand Central Parkway was slapped with a departmental charge for the man’s death, sources told the Daily News. 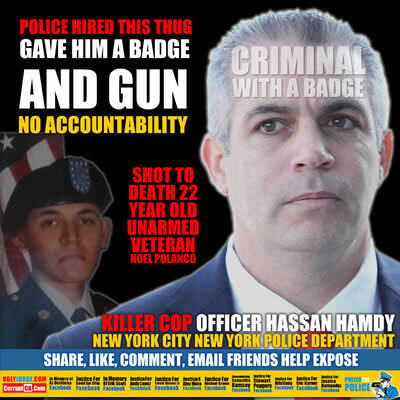 Emergency Service Unit Detective Hassan Hamdy was charged late Thursday with “failing to employ proper tactics causing a civilian’s death” for blasting Noel Polanco, 22, in the chest after he was stopped for reckless driving on Oct. 4, 2012, the sources said. “He’s not happy about it,” said one source who spoke to the 15-year veteran after he was charged.